Tempo, a powerful calendar app for the iPhone, goes beyond just displaying events and dates, instead pulling together multiple calendars and contextual data to serve as a digital assistant. It’s a productivity powerhouse on the iPhone, but until now has been missing from the iPad. This is finally being rectified, as starting on Thursday Tempo is available as a universal app. I had access to a pre-release version to explore its features on the iPad. While it had a few of the to-be-expected bugs, the beta version provided a good picture of how Tempo will streamline your overall workflow on a larger screen. As on the iPhone, Tempo outperforms a mere “calendar” app, as it’s also capable of autodialling into conference calls, pulls up a map to your next destination, and will even fetch an Uber car for you. Current users of Tempo on the iPhone who also use an iPad will likely be eager to download the update on their tablet. Fortunately, if you have a Tempo account all you need to do is log in and your calendars will flow right in. If you are new to Tempo, create an account and then connect any Google or Microsoft Exchange calendars you use. 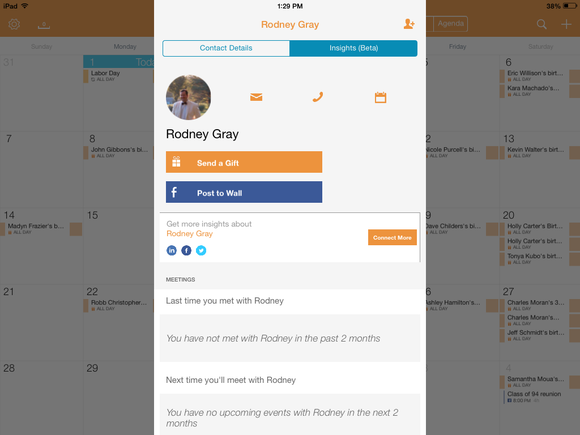 Add in Google and Microsoft Exchange calendars into the Tempo app. Don’t stop there, though: The premise of Tempo is not to just store all your calendar data, but to serve as a pseudo digital assistant. Connect the app to your LinkedIn, Facebook, Twitter, Google+, Klout, and other accounts to get background info on your contacts. For example, say you’re heading into a meeting: You can tap the event and get information about others attending through the Insights tab, which includes past meeting dates and links to their social media profiles. It’s a much faster way of getting a refresher about who you’re connecting with than simply Googling them. Another of the benchmark features making its way to the iPad is the ability to join a conference call without requiring you to enter that annoying 16-digit PIN. While you may use it less on the iPad, it’s still useful to have if you tend to make calls over Wi-Fi or would rather not dig for your phone. Having used this on an iPhone I can verify it is every bit as awesome as it sounds. Get a quick refresher on who you are going to be meeting with Tempo’s Insights feature. A similarly useful feature is the ability to quickly create a conference call through Tempo’s partnership with Speek. 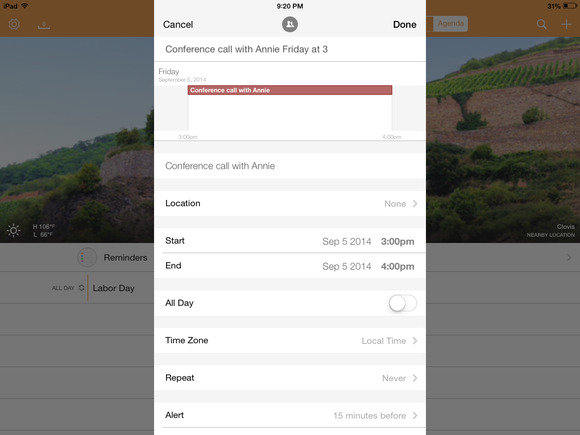 When creating a new calendar invite, you can add a conference call powered by Speek for up to five individuals. If your organization uses its own service this may not be necessary, but it is a nice feature for freelancers or small business users who would benefit from the free service. Tempo also wants to make anything you add to the calendar a quick and painless process, as it recognizes everyday (or “natural”) language for events. For example, just type in “lunch on Friday at 3 pm” to create a calendar entry instead of tapping several categories or using more arcane language. The rest of Tempo’s interface is identical to its current design on the iPhone, providing five different display options: agenda, week, and month. The interface is minimalist, with plenty of white space and soft gray and orange accents. You can adjust which subsections of your accounts appear in the different views. For example, when connecting to Facebook you may find it helpful to display Facebook events, but turn off birthdays in order to reduce the clutter in the calendar. If you acquire additional calendar accounts they can be added at any time just by tapping on the Calendars section in the settings. This feature didn’t work while testing it on the iPad, but it is present on the iPhone and presumably will be fixed as the app goes live. Tempo also utilizes the capabilities of iOS’s notification center, pushing information for upcoming events, conference calls, driving directions, and traffic alerts. Tapping on the alert will take you to the specific action, such as jumping right into dialing for the conference call or checking the status of a forthcoming flight. Just be sure you turn off the notifications from the stock iOS calendar to avoid duplicate messages. 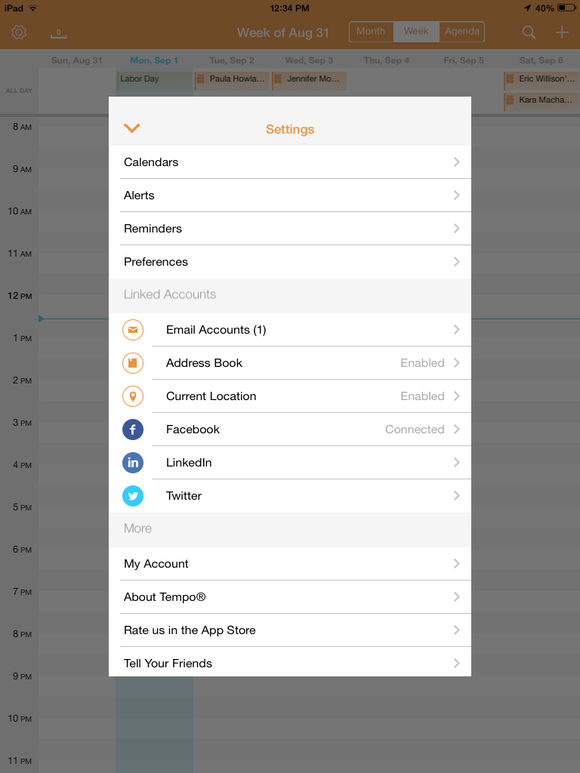 Tempo plans to take its calendar beyond the iPad, as there is a beta test page on the site to sign up to try a version for an Android phone, tablet, or the Web. There is no indication, however, when apps will launch on those different platforms. Tempo is available for free and requires iOS 7.0 or later.